Jeffrey Steele was born in Cardiff, south Wales, on 3rd July 1931. His father, Arthur, a slate fireplace enameller, and mother, Enid, a Woolworths shop girl, came from the docklands area and met at the local Anglican church, St Mary’s. Their forebears had arrived in Cardiff from England in the expansion of the city as the main coal exporting port for Welsh valleys from the mid-19th century. Jeffrey had a younger brother, Philip, and the family settled in the Roath district. 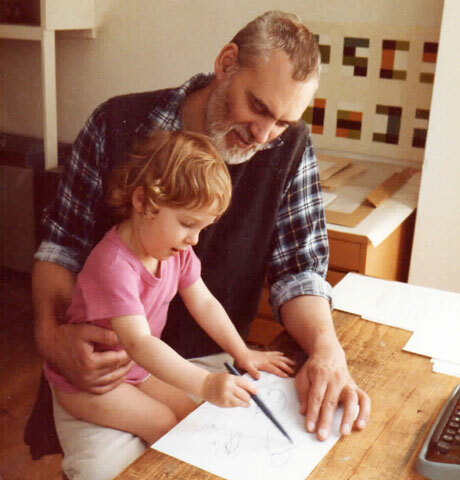 JS passed an exam to enter the Howard Gardens high school in 1942, where a variety of talented teachers encouraged his interest in art and “helped me to break free of what I was beginning to recognise as the oppressive ideology of my family and church upbringing”*. At about this time the National Museum of Wales inherited a collection of Impressionist and other paintings from the Davies coal-owning family, which JS was able to see. In 1948, after brief employment as a tax clerk, JS won a scholarship to Cardiff art school, and soon realised he wanted to be a painter. Here, he often found himself at odds with the school authorities. In the summer of 1949 he discovered hitchhiking, fitting in brief jobs at a holiday camp in north Wales and as a designer at a West Country pottery, and visiting London. 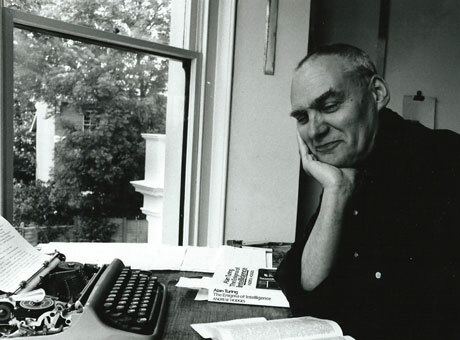 He became friends with an older art student, David White, who “encouraged my inclination to be critical and argumentative in my approach to the teaching programme”. One autumn evening JS and White went to the poor Adamsdown district in search of a studio to escape the restrictions of the school and found a loft space in a dilapidated scrap yard, which they rented for five shillings a week. JS felt that the art school’s teaching was unrelated to the actual practice of contemporary art. In 1950 he was reprimanded for spending too much time out of the college. He then did badly in the exams and was denied admission to the painting school. He was offered instead a place on the illustration course, which he refused. He joined the painting course at Newport instead, 13 miles away, which involved gruelling daily cycle rides. He had signed up, as legally required, for compulsory military service but now decided to register as a conscientious objector due to his pacifism. This and his atheism caused him to be temporarily ejected from the family home by his mother. 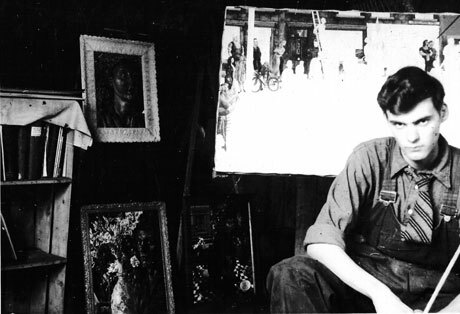 JS was influenced by Stanley Spencer, and even hitchhiked to visit him at his home in Berkshire. Some of his Spencer-inspired paintings were purchased by the Newport Museum and Art Gallery**, and by local art collectors. In 1952, he later wrote, “I presented deliberately provocative and unfinished paintings for my final examination and duly failed”. But he had been commissioned by a Newport art collector, Ernest Samson, to paint 30 pictures, for £20 apiece, and began work on the first, which turned out to be the only completed work of the set. Christ Carrying the Cross was exhibited in the Royal Academy summer show the following year, where it aroused much comment. Also that summer JS faced a tribunal for refusing his military service and was instructed as an alternative to work as a porter at the city’s St David’s hospital for two years and 60 days. JS moved to a studio in High Street, Cardiff, and continued working and experimenting with representative styles, while taking part in a lively creative scene in Cardiff. He exhibited and sold several paintings locally. At a friend’s studio, JS met Glenda Reynolds, born in 1936 in Clynderwen, West Wales, who was working as a secretary in Cardiff, and they began a relationship. JS found a job monitoring radio equipment at a Rediffusion office near his flat. In October 1956 the couple moved to London for a year, where JS worked as a warehouseman for the Stoll Theatre while Glenda worked in art galleries. Glenda and JS married shortly before their son Simon was born on 5th January 1958. On 9th March 1959 Tamara was born. 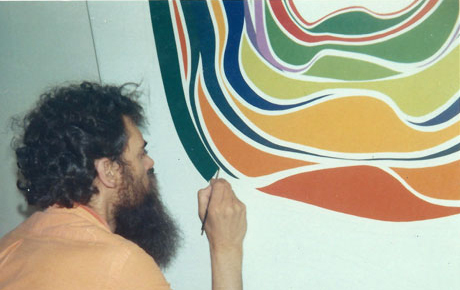 In 1958 JS made the decision to be an abstract artist, but did not yet want to sever representational connections completely. In 1959 he was awarded a French government scholarship to study in Paris for three months. 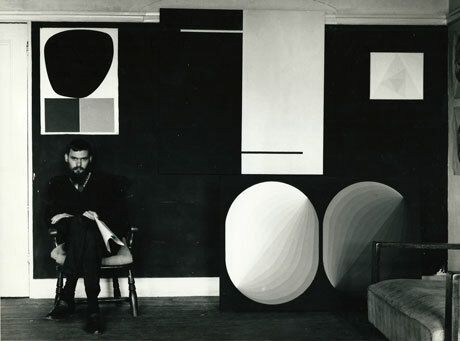 There he encountered the work of artists such as Victor Vasarely, Max Bill and Josef Albers, and decided like them to adopt a geometrical abstract approach, which lasted the rest of his life. The show “Antagonismes” at the musée des Arts décoratifs made a particular impression. Back in Cardiff in 1960 he resolved to make a fresh start and destroyed his figurative work. He began with the simplest possible situation, what cannot be jettisoned if one is to be a painter: the space of the canvas, articulated with black oil paint, in a binary relationship with the white (primed) canvas. He depicted ovals, ellipses, triangles, squares, oblongs and other polygonal forms in increasingly complex relationships with each other and the ground. He was to continue working in monochrome for eight years. 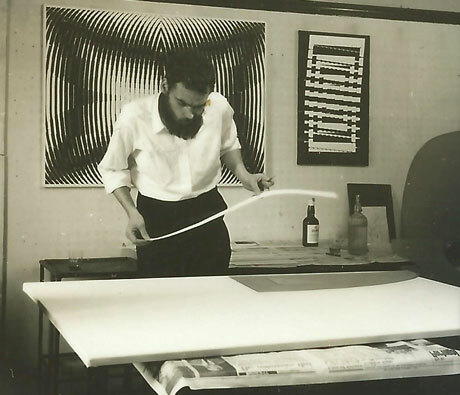 In 1961 he started showing his new works in solo and group shows in London and elsewhere, and began teaching in various schools and colleges in Cardiff. 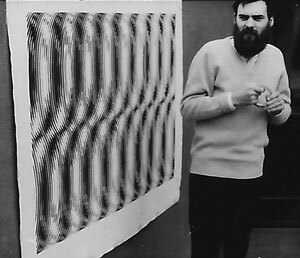 In 1965 his work Baroque Experiment: Fred Maddox was shown at the Op-Art exhibition “The Responsive Eye” in New York. JS spent three weeks in the city, staying at the Chelsea Hotel and meeting critics and other artists. He was appointed a lecturer at Newport art college that year. After his marriage to Glenda ended he began a relationship with Arja Nenonen, a Finnish artist-weaver, who had two sons from her marriage to the architect Malcolm Quantrill. JS and Arja married in 1966 and set up home with the four children in the Penylan suburb of Cardiff. In 1968 JS was appointed head of fine art at Portsmouth art college, and the family moved to a house on the seafront at Southsea. In 1969 JS and Nenonen organised the group exhibition “Systeemi” in Helsinki, which led to the formation of the Systems group of artists. This ceased to exist in the mid-1970s but members continued to exhibit together informally in Britain and continental Europe. The art college became part of Portsmouth Polytechnic and JS became a principal lecturer. He organised and presented courses on theoretical and political aspects of art, having become a Marxist. He and colleagues explored the relationship between art and music and JS became a member of the Portsmouth Sinfonia experimental orchestra, on trombone. In the mid-1970s his marriage to Arja Nenonen ended. 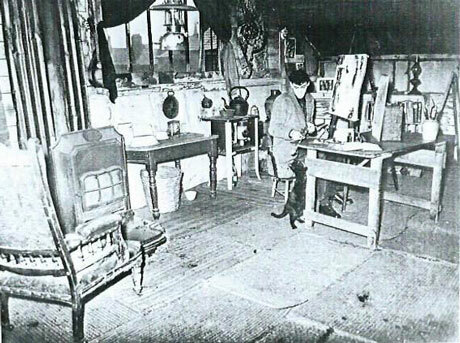 He was to have several close relationships after this, including one with the artist Judy Clark, which led to the birth of Clara Clark, who also became an artist, but he was to live alone thereafter. In 1988 fine art teaching ceased in Portsmouth, the department’s functions transferring to Winchester. JS retired from teaching, but continued to live and work in Southsea. * Quotations from an unpublished memoir by JS. ** One of these is shown on the BBC’s “Your Paintings” website in the JS section.